Thuja Green Giant – How Fast Does It Really Grow? Here we have the most common question about this tree, and the one where fact and fiction have become twisted together on that most confusing source of knowledge – the internet. Let’s try to untangle that information and get closer to a factual understanding of how fast (and large) it might grow for you, in your location, without the hype, and using some real research to reach our conclusions. Thuja Green Giant is the most popular evergreen for screening, hedges or specimens in all but the coldest areas of the country, and the hottest and driest. It is hardy from zone 5 to zone 9, which covers most of the country. Its dense evergreen foliage in a rich green color is the perfect backdrop for a garden, and its dense foliage protects your garden from noise and wind. It is also easily grown in most soils, and its toughness, disease and pest resistance, and resistance to deer too, makes it an easy, low-maintenance plant too. Newly planted trees need attention to watering until they become established, but after that Thuja Green Giant will largely take care of itself. It is naturally dense, so it develops into a solid screen even if you never trim it. It also trims easily of course, and it is easy to make beautiful hedges with this tree. One of the big selling points of Thuja Green Giant is its growth rate. Among evergreens it is probably the fastest grower available, and that ability, and its overall toughness, comes from its hybrid origins. It is a cross between two different Arborvitae species, Japanese Thuja (Thuja standishii) and Western Redcedar (Thuja plicata). This cross was made in Denmark in the 1930s, but it was only after a plant was given to the National Arboretum in Washington that it drew any attention, and only in the 1990s that it became widely available. Since then it has shot to the top in popularity among gardeners. Hybrid plants are usually tougher and more vigorous than either of their parents, and Thuja Green Giant is no exception to that rule. This is why it has a remarkable growth rate. So how fast can it grow? Under average conditions young plants can add 3 and even 4 feet of height each year. Under ideal environmental and climatic conditions it is certainly possible to exceed this, and rates of 5 feet, or perhaps even more, are possible. But for most garden conditions across most of the country, 3 to 4 feet is something you can comfortable expect to see during the early years. We will look later at the different factors that have to be considered to arrive at a realistic estimate in any particular situation, but first, let’s look at some real research that is proven, not just a guess from someone wanting to sell ‘fast-growing trees’. Back in 1999 the Commercial Horticulture Department of the University of Arkansas established a unique Plant Evaluation Program. Unlike other similar programs using just one site, three sites were established across the state, in three climate zones – zone 6b, 7a and 8a. These allow for comparisons in different climates, assessing both winter hardiness and heat resistance. In 2001 small plants of Thuja Green Giant in 1-gallon pots, were planted at these sites. The trees were planted in full sun, with initial fertilizer and drip irrigation. They were spaced 10 feet apart, and no pest-control or trimming was carried out. Each year the plants were measured, and records kept for 5 years. The results for Thuja Green Giant were remarkable. At the end of the 5-year period those small plants had an average height just short of 10 feet, and a width of 5 ½ feet. The trees in the warmest location (8a) were 11 ½ feet tall! Even at the coldest (6b) and windiest site they were almost 10 feet tall. The slowest growth was at the zone 7a site, possible due to a period of very wet weather one spring, causing root problems. The years with the fastest growth rate were the second, third, and fourth years, with the plants in the warmest site adding a full 5 feet in their third year alone! The developers of the program (Dr. James Robbins and Dr. Jon Lindstrom) highly recommended Thuja Green Giant as a hedge or screening plant, and it was the fastest-growing evergreen in the trial. See the results here for more details. 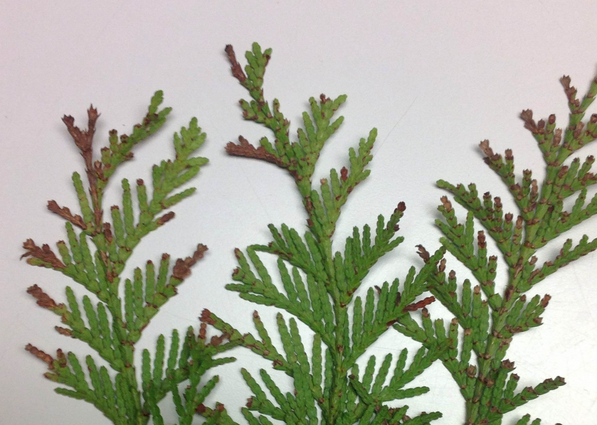 What Affects the Growth Rate of Thuja Green Giant? This careful scientific work tells us that under average conditions Thuja Green Giant will increase its height by 3 to 5 feet in each year. It also sheds some light on the factors that influence that growth, and we also have some other general ways of deciding exactly how much growth to expect. Notice how in the Arkansas research the trees grew tallest in the warmest zone. This might seem like ‘common sense’, but it relates more to the length of the growing season than other factors such as winter lows (which are the basis of the USDA zoning system). We see the effect of a longer growing season in many plants. Grasses from warm climates bloom in zone 6 and not in zone 4 because they have more time to develop their blooms, not because it is colder in zone 4 in winter. This is an important distinction, because within a single zone factors such as sun exposure and wind affect the length of the season. Most hardy plants like Thuja Green Giant will not grow below temperatures of 45 to 50 degrees. The higher the total number of days the temperature is above that, the more growth. A shady, windy garden will have fewer days above 50, even in the same zone. As well, steady winds make all plants grow shorter, and in an exposed site you will not get as much height as in a sheltered spot. Every year is different, and weather patterns each year are important. You could be unlucky, and encounter a cold, wet summer the year you plant, or the following year. You will not get the same level of growth from your newly-planted Thuja Green Giant if that happens. If, on the other hand, you have an early spring, and many warm, calm days, growth will be greater. As noted in the research, a wet spring seriously slowed the growth at one site, resulting in much shorter plants after 5 years. Some soils are fertile, while others are sand or gravel, with low fertility. These soils cannot support the maximum rapid growth a ‘rich, well-drained loam’ (ever gardener’s dream soil) can do. Poorly drained soils will also slow growth, although a steady supply of enough water is necessary to maximize growth. The north-west, where one parent comes from, and Japan, home of the other one, are places with warm but rainy summers, and mild winters. The growing season is long, and Thuja Green Giant is adapted to the typical soils of those areas. So, in America, the north-west is probably the area where the greatest growth – perhaps that elusive 5 feet a year, is most likely to happen. If you live in the dry south-west, even though you have lots of sun and heat, you will not see such a high growth rate. We can see from all this that absolute statements about the growth you can expect from Thuja Green Giant are impossible. Is this a fast-growing tree? Definitely yes. What does that mean in your particular garden? You be the judge. What is your zone? What is your soil like? Will you feed and water regularly? How sunny is the place you are planting in? How sheltered is it? What is your soil like? These are just the most important questions you need to ask, but combining it with the data above, you should be able to come to a realistic conclusion for your own garden.